How do you share with others your vision of yourself? Using streaming content in social media you can choose a platform that matches your needs. Using Blogs and personal website content you own the pace at which others learn about you. With both of these approaches your reach is only as broad as the number of people who follow you. Your resume, either on LinkedIn or printed, tends to show what you do and not who you are and still connects with those looking for you. None of these require a great deal of introspection to arrive at the messages you send outward into the internet. 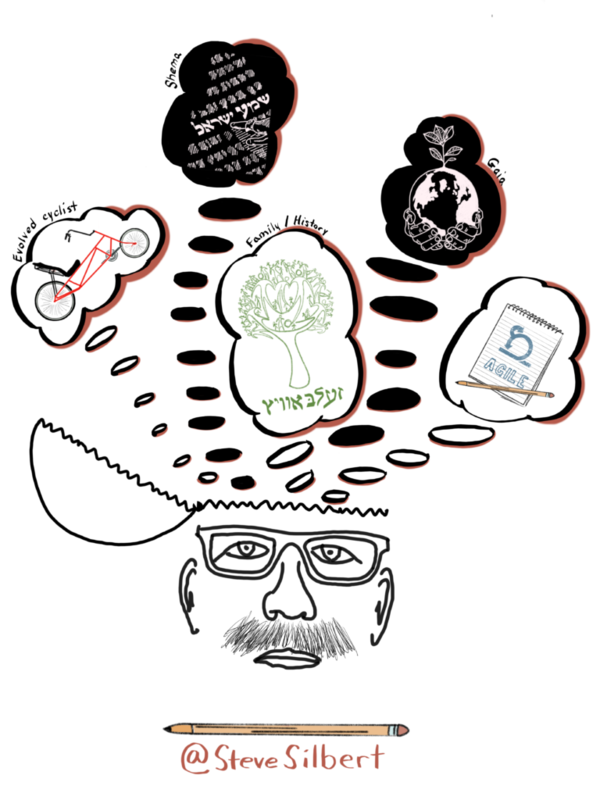 Why not try sketchnoting a selfie? Sketchnoting a selfie does not mean drawing a picture of your face. Remember, sketchnoting is about visuals, composition, and layout. It’s your chance to tell the visually story of you to you (and others if you like). So the first thing to do is to listen to the TED Talk that you give on the topic of you. You listen for those really important things in your talk and doodle them down. Connect the ideas in a visually flow, then add some text – not a lot – to fill in the blanks. This is not a resume or a book report and cannot contain EVERYTHING about you, so just pick 5-10 things that are core to you and sketch those. My sketchnote selfie contains only five items – I’ve been a long distance cyclist for many years and my wife and I ride long wheel-base recumbents as a way of be-ing together and experiencing the outside world. I’m a learner and the core of my personal learning journey lie in my Jewish education. My family is important to me and I’ve been an avid genealogist for 30ish years, my wife and I eat organically and have replaced grass in our yard with sustainables and edibles. And of course Agile is in my bones. I’d love to see your sketchnote selfie. Give it a try. It’s about the ideas, not artwork.